The state of Maharashtra was deep in grief mourning the death of their iconic leader of the Shiv Sena for the past 45 years, Balasaheb Thakre. He suffered from natural ailments and passed away on Saturday afternoon, soon after the festivities of Diwali and Bhai-duj. There was a state-wide bandh as a result of his death on saturday and sunday. All the streets were deserted and all shops and businesses shut down due to the bandh. This included all the wholesalers and retailers as well, leaving people to wait for two days before they could get any groceries or vegetables. The people of Mumbai who wished to pay their last respects to their great leader were given the chance to do so on sunday before the body was taken in a procession to Shivaji Park for the final cremation ceremony before all the fans and followers who waited there patiently the whole day. The park was filled to the brim as the people crowded in to see their leader for the last time. Shivaji Park apparently was a fitting place for the final cremation ceremony for Balasaheb Thakre as this is where he had addressed a crowd of people, giving a moving and impacting speech for the first time when he was young. All the people who remembered him and his speech were overwhelmed emotionally by this last tribute to the great leader and could not help but shed tears. All the great big-wigs and important people, politicians and Bollywood stars came to pay their last respects to Balasaheb Thakre. The entire police squad of Mumbai were busy with the bandobast of his last rites and to make sure that the city maintained peace and quiet during the weekend. Earlier, there had been rumors of his death on the day of Diwali, but the news channels reported otherwise saying that though his condition was critical, he was stabilized. The 21-year-old who posted, "Respect is earned, not given and definitely not forced. Today Mumbai shuts down due to fear and not due to respect", says she "will never post on Facebook again." She also says, in a low voice, a blue and green dupatta pulled tight across her face, that, "I would like to apologise. 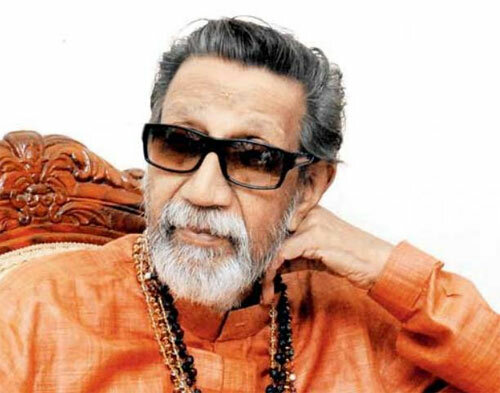 He (Bal Thackeray) was a great man." The other girl was arrested for merely "liking" the status. The prompt action of the police for arresting these girls due to pressure from the Shiv Sainiks received a lot of furore from the public and social networking sites like Twitter, where people posted their ire. The action of the police questions our basic democratic rights and freedom of expression. And a basic question remains unanswered - Why were any of the Sainiks who vandalized the orthopaedic clinic that belonged to the young woman's uncle, not arrested? Updated news today states that nine people were arrested today morning for the vandalism and an inquiry will be held led by a senior cop into the arrests of the young women. Sources say there is consternation in the police headquarters in Mumbai over the action of the Palghar police. "We have ordered an inquiry... if any further action needs to be taken the probe team will decide and send a report. On this report we will act," Deven Bharti, IG (Law and Order), Maharashtra Police said. The Shiv Sena leader's death on Saturday afternoon had brought Mumbai to a virtual standstill on Sunday, with shops and other establishments shutting and taxis going off the roads, amid fears of violence by Mr Thackeray's supporters. There was, however, no untoward incident in Mumbai over the weekend. Shiv Sena chief Bal Thackeray(86), who died on Saturday, was cremated with full state honors in Mumbai on Sunday. Thackeray whose climb to fame was due to his championing the cause of the marginalised 'Marathi manoos' saw a sea of humanity coming to his funeral from not just all parts of the state but also from the country.